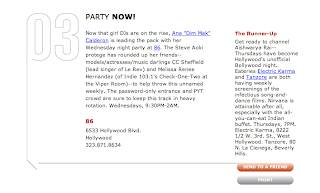 Now that girl DJs are on the rise, Ana "Dim Mak" Calderon is leading the pack with her Wednesday night party at 86. The Steve Aoki protege has rounded up her friends--models/actresses/music darlings CC Sheffield (lead singer of Le Rev) and Melissa Renee Hernandez (of Indie 103.1's Check-One-Two at the Viper Room)--to help throw this unnamed weekly. The password-only entrance and PYT crowd are sure to keep this track in heavy rotation. Wednesdays, 9:30PM-2AM.